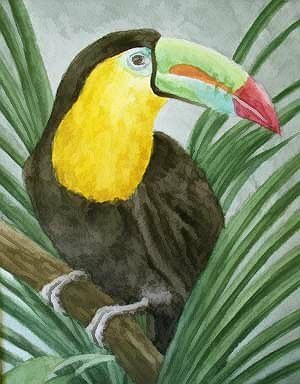 I was browsing through my sketch book that contains doodles for art ideas and came across some toucan doodles, one of which seemed like it would make a good painting. This small watercolor is the result of that doodle. I like painting birds but the challenge of painting toucans is their large beak seems to get in the way of making a composition, but nonetheless I like this painting enough to have started a computer version of it which I hope to post once it's finished.